A MEDIEVAL pilgrimage route to major historic religious site is to be resurrected – and organisers hope it will grow to rival a similar event in Spain. The Way of St Andrews will allow travellers to a route taken by 11th and 12th century Christian devotees who flocked to the Fife town, once home to the largest church in Scotland. Those behind the trail hope the 62 mile trip, starting from St Mary’s Cathedral in Edinburgh, could prove as popular as the Camino de Santiago de Compostela in northern Spain. Hugh Lockhart, a parishioner at the Edinburgh church, came up with the idea after hearing about the Spanish journey, which attracts hundreds of thousands of participants every year, and was immortalised last year in a film starring James Nisbett and Martin Sheen. Mr Lockhart will be part of a group of 60 pilgrims who will set off from the capital in July, they will take the old route out of the city, which is known as St Margaret’s Way.. 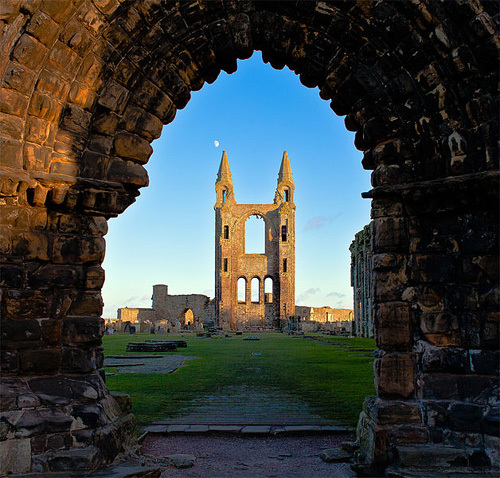 He said: “It captured my imagination, the idea of walking through the countryside and arriving at this fantastic church, and then I heard that St Andrews had once been a great place of pilgrimage before the Reformation so we decided to give it a go and see what would happen. The pilgrimage, which is set to arrive in the Fife town on July 5, even has the backing of Cardinal Keith O’Brien, who heads the Scottish Catholic Church. The route will take in other sites of religious significance as it winds up the Fife coast. The pilgrims will be able to visit St Fillan’s Cave in Pittenweem, home to an 8th century hermit, and Chapel Green near Lower Largo, which once was home to a small church used by pilgrims. The walkers will leave Edinburgh and travel to South Queensferr before travelling through Burntisland, Leven and Earlsferry before travelling on to St Andrews. Professor John Lennon, an expert in Travel and Tourism at Glasgow Caledonian University, said The Way of St Andrews could become an attractive tourist activity. He said: “You have to admire the creativity and inventiveness of doing something like this. The Route to Compostela is a pan-european route which, during the pre-motorised era, started at the pilgrim’s front door and was not simply a path across Northern Spain. There are therefore routes to Compostela from as far afield (for the Scots) as Helsinki, Warsaw, Budapest, Oslo, and Amsterdam for example which can all be walked. These now resurrected routes feel like a part of the great European project or experiment when you are walking with people of all nations – actually across the world – as part of a way of greater understanding and friendship. These parochial intra scottish routes, while good, should be joined up with the european routes to Compostela and Rome and then the world could partake in the magnificent routes from Iona, St Andrew’s, Glasgow and Linlithgow (from where James IVth promoted pilgramage) using current footpaths and canals and coastal walks running from Musselburgh to North Shields to catch the boat to Holland. And then on through Belgium and France. Not forgetting of course that the greater the sacrifice in pilgimage the fewer days spent in purgatory! So lets get our paths into this pan european network and stop using them simply as a commercial enterprise – although cynics might say that was their original purpose too.